Horses will be added and deleted as inventory changes. Also notice, not all horses for sale are on this list - ask if you have a particular need and don't see what you are looking for. If you are returning to this page to look at a specific horse or pony and cannot find it - it's been deleted because it has been sold. 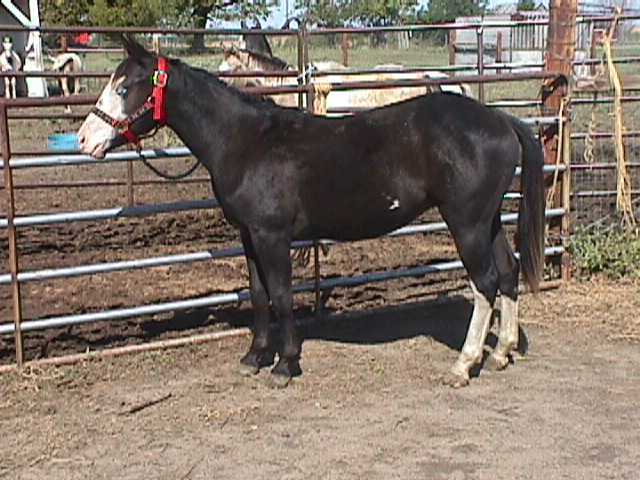 Dam: Sequoias Tomboy - 'Hard Twist' bred AQHA mare. This mare is by APHA Champion Jester Heathen and her dam is by a son of AQHA Docs Lynx. She is just over 15 hands tall, and has had 30 days riding (summer 2000) She was extensively trail ridden and would go through anything and anywhere you pointed her. She has been vet checked in foal to A Breeze of Class for a spring, 2002 foal. Both mare and foal are healthy, sound and have no bad habits. She belongs to an out-of-state buyer who, due to health problems is needing to resell this bred mare and her colt. ***UPDATE*** The man says, "Sell these horses." He will accept $1750 on the mare and $900 on the colt (Who is now weaned, leading, etc, and ready to go!!). Yeah, I know, laugh if you have to. This 20 year old mule has spent most of her life packing everyone and anything in the mountains. She was last used as a trail horse at a 'Dude Ranch'. We put the non-riders on this old lady. She is very well broke, over 15 hands tall and sound for light riding. She's been primarily used as a baby sitter to help our foals through the weaning process. She's great around the young ones and very quiet and gentle. She'll also take care of any coyotes and wild dogs during foaling season. This sweet, elegant filly has the most gorgeous roan coloring. She is sound, correct, and has no bad habits or vices. She should mature around 15 hands, as she is just under that right now. Basic ground work is done. She's ready to start riding. If not sold by spring, she will be bred to A Breeze of Class. The resulting paint foal will not only have an incredible pedigree, but will have a 75% chance of being dun, grulla, or even blue roan!! This sweet old mare is our 'rescue' project. She was near starvation when we bought her from a local pony trader. She was unable to eat due to improper dental attention. One vet trip and the problem was solved. She is a great little mare, standing about 14 hands, maybe a little more. She has wonderful color and must be part Walker or Fox Trotter. The girls have ridden her and she is broke for any age child. She neck reins as well as anything on the place and steps right into that gaited shuffle. She's a pretty cool mare. Her age is around 20, the vet feels she has many years of use left in her. She travels sound, no leg or lung problems, but she has diminished vision in one eye and an old neck injury that has resulted in her breathing to sound louder than normal. At this point, including vet bills we have invested about $500 in the mare. We obviously don't raise horses to lose money, but this is a rescue and we would be willing to take a loss if this mare were to go to a good home with little kids. This gorgeous gelding has just completed 30 days of riding. He willingly will do arena work (w/t/c) and has also been out on trail rides. Not much bothers this guy. He stands around 13.2 and is extremely stout. Because of his build, he will work for a shorter adult quite well, in addition to being the height for a child or youth. He is now beginning training to pull a cart. **UPDATE** He's riding. He's quiet and gentle and shows incredible sense under saddle. 30 days ride out on trails. I know, hard to see with all the snow glare, sorry. Trust me, he's as stout and square as you will ever find for a coming 3 year old gelding. This guy is sweet and quiet and has already been ridden a couple of times. No fuss, no fight, ready to continue with his training. He stands a good 14.3, should mature right at 15 hands (mid-July,1999 foal)His dam is our bay granddaughter of Poco Tivio and his sire is a son of Smokey Duster Too. Sorry, but when we bought the bred mare we knew there would be no breeders certificate for her foal, so this colt can not get registration papers. Hey, he's a gelding, what do you care?? If interested, I can get you better photos. We can also arrange to have an additional 30 days ride put on him at your cost of $250. This pretty guy already stands close to 15.3 at his hips, and he's not quite 2 years old. He's big and he's pretty, and he has no Impressive blood. The back row of his papers are Beaus My Daddy, Call Me Scotty, The Redeemer, and Jacks Over Kings. Selling for a friend. email for name and phone #. 15.3 hands, has been ridden a couple of times. Quiet and gentle. Sonny Side Up and Air Force One on papers.